No doubt there is still smoke in the air over Stoneleigh Park in Warwickshire, England tonight, but the coal forges are dark, the hammers have gone silent, the horses are loaded and the farriers? Well, they're probably celebrating somewhere, or else on planes and ferries and trains to the 11 nations they call home. They all have plenty to celebrate, since just getting to compete at the International Team Horseshoeing Championships is a victory, and representing your country is an honor. If you care about scores or the order of finish, this article is for you. A farrier revolt has been brewing for some time in the state of New South Wales in Australia. Some--but not all--farriers there are angry and they want their state government to take action. 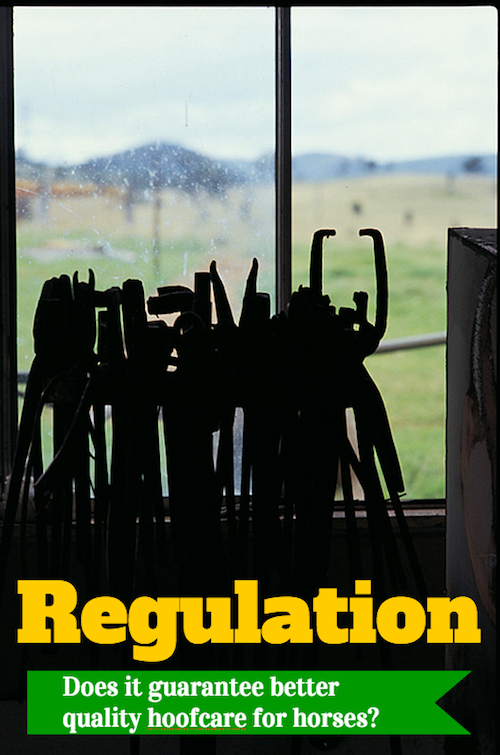 In what seems like a counter-intuitive plea to Parliament, the National Master Farriers Association of New South Wales is presenting a draft of legislation that would regulate farriery and bring unqualified and untrained "backyard" shoers and trimmers into the fold of formal education and apprenticeship training. 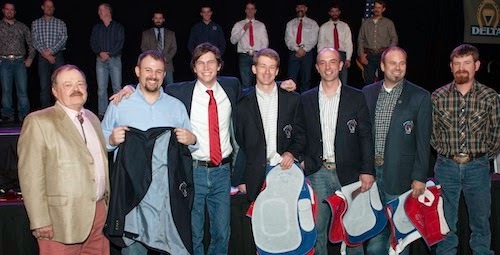 The American Farriers Team was named at the 2014 American Farrier's Association Convention. From left to right: Immediate Past President John Blombach, CJF; Jake Engler, CJF; Josh Stanley, CJF; Rusty Wells, CJF; Ben Mangan, CJF; Robbie Mederos, CJF; and Tom Petersen, CJF. Photo courtesy of the AFA. 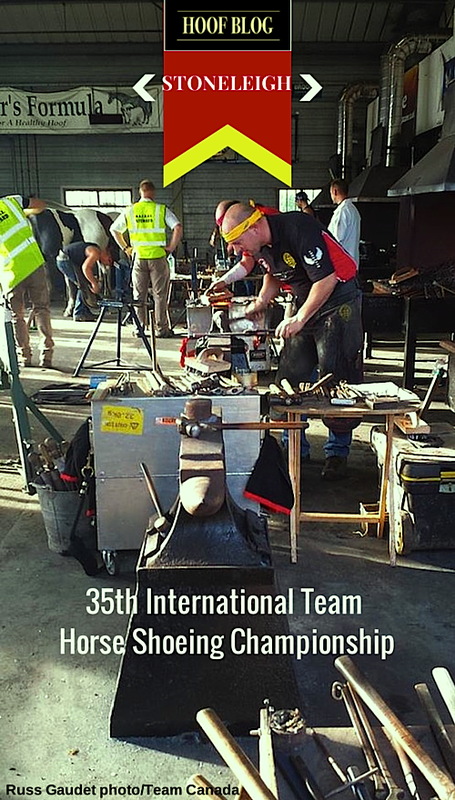 The American Farrier’s Association (AFA) is pleased to announce that the 2014 American Farrier’s Team (AFT) has been in England for several days preparing for the International Team Horseshoeing Championships which will get underway at Stoneleigh Park on Saturday, September 27th. Beginning in 2015, Massey University's College of Sciences in New Zealand will be led by internationally-recognized veterinary and agricultural science specialist Professor Raymond Geor, BVSc, MVSc, PhD, DACVIM. Professor Geor is currently Professor and Chairperson of Large Animal Clinical Sciences at Michigan State University College of Veterinary Medicine in the United States. In recent years, his research and publications have been invaluable to the understanding of obesity and Equine Metabolic Syndrome in horses, and how it may relate to laminitis, as well as more than 180 other research papers in equine nutrition and physiology. The university Vice-Chancellor Steve Maharey announced today that Professor Geor will replace the current Pro Vice-Chancellor of the college, Professor Robert Anderson, who is retiring later this year. Professor Geor is a Massey Bachelor of Veterinary Science graduate (1983) who has worked in tertiary education in the United States and Canada for most of the past 30 years. He was raised in Havelock North and attended St John's College in Hastings, both in New Zealand. He has a Master of Veterinary Science from the University of Saskatchewan, a PhD in Physiology from The Ohio State University and breadth of institutional experience in veterinary medicine and agriculture as a leader/administrator, professor, clinical veterinarian, teacher and researcher. That experience includes his current role at Michigan State, as well as posts at Virginia Tech University, Kentucky Equine Research Incorporated, University of Minnesota, the University of Guelph and the University of Saskatchewan in Canada, as well as a practicing veterinarian in New Zealand. Geor has been a frequent presenter in the research program at the International Equine Conference on Laminitis and Diseases of the Foot in West Palm Beach, Florida. He will join the university in March next year. Implanted Prosthetic Limbs for Amputee Horses: Be Part of Research! Six years ago, Molly the Pony turned the world upside down on by wearing a strap-on prosthetic on her amputated limb. If she read the newspaper this week, the peg-leg pony who survived Hurricane Katrina in New Orleans might think she needs to come out of retirement on behalf of her new prosthesis designer, Niki Marie Hansen. 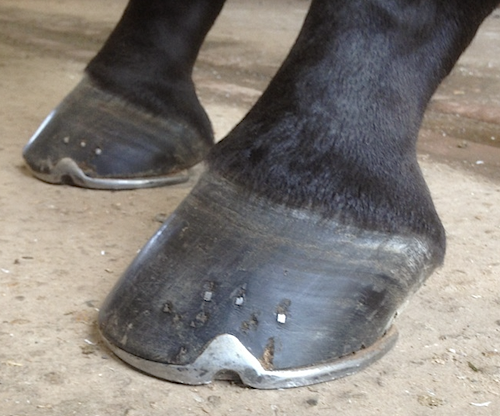 Hansen believes it's time for a new generation of artificial limbs for horses. 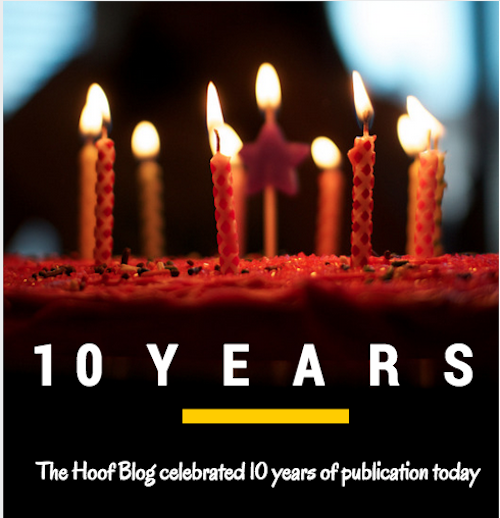 The 10th anniversary of The Hoof Blog almost slipped by unnoticed. There were no stars on the calendar, no reminders popped up in email. Time just flies by and there's way too much to do and it's far too risky to stop and reflect on all that's happened or all that may happen, so let's celebrate by sharing some statistics about you, the ones who make it all possible! A survey-based research project is being conducted by Melissa Kelson, a student at the Royal Veterinary College in Great Britain, to compare and contrast the evaluation of body condition by owners, farriers, and vets. Ultimately, the project will explore some of the ways the farrier and veterinary communities can best communicate with owners on the matter of weight management. 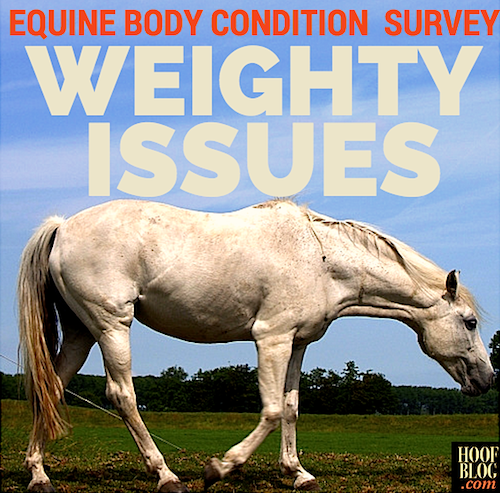 Whether you are a horse owner, veterinarian, or farrier please take just a few minutes to complete the relevant survey to help develop the best strategies for regulating weight in horses. 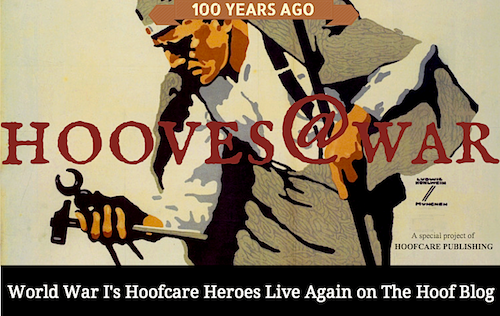 Today, the Hoof Blog's Hooves@War series moves back to Australia, where a small note about a farrier's enlistment for World War I led me to research more about him and his horseman father. Meet the Burchells of South Australia. Corporal Charles Burkin Burchell was Shoeing Smith in the 3rd Brigade, Ammunition Column, Field Artillery, Military District 4 of the First Australian Imperial Force (AIF). He enlisted 100 years ago today, on September 12, 1914 at Adelaide, South Australia. Six weeks later, the AIF shipped out for Egypt; Charles was in the first group of Australians to head to the center of the conflict. 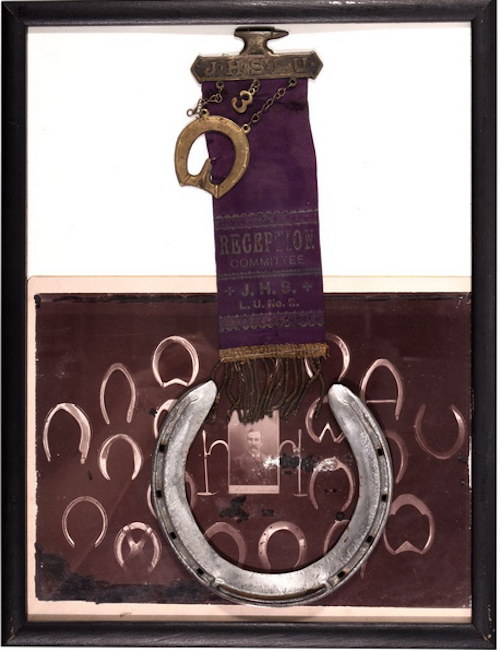 A souvenir diorama from Utica, New York combines the past and present of the IUJH: a meticulous shoe board, a grandly ornate convention ribbon, a photo of an unknown horseshoer, and a contemporary raceplate, no doubt signifying the union's strength at the racetracks. It was 121 years ago that a footnote in labor history turned into a solid hoofprint. The International Union of Journeyman Horseshoers was incorporated at Denver, Colorado, on September 12, 1893 after having been affiliated with the American Federation of Labor until July 1 of that year. The front feet of the Irish Sport Horse Coolys Luxury, who was selected as the Best Shod Horse at the Land Rover Burghley Horse Trials in England last weekend. Farrier Jim Hayter received the prize along with owner David Corney and rider Tom Crisp. 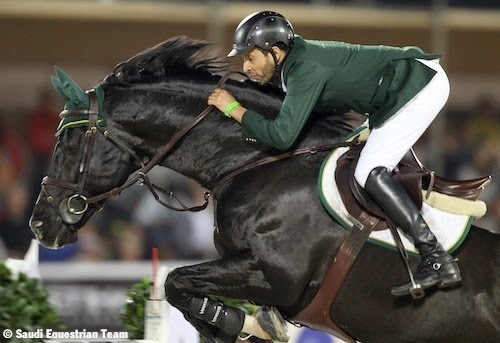 The judges must have thought Jim handled this horse's asymmetry challenges well. "I cannot keep the foot too long as I don't want to risk him pulling shoes off," Jim commented. Keeping up with the tradition of chasing down British eventers and farriers to find out what it takes to be judged the Best Shod Horse at an international three-day event, the Hoof Blog has a few photos of this year's winner at the Land Rover Burghley Horse Trials in England. 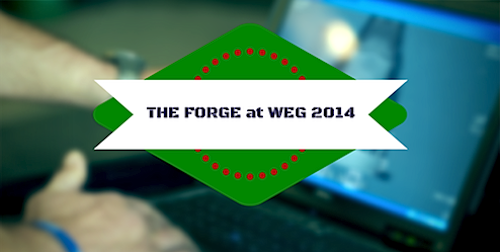 World Equestrian Games Farriers: What's Inside WEG's Pop-Up Forge? In a village of pop-up horse stables and instant schooling arenas sits the World Equestrian Games' pop-up vet clinic with its dedicated forge. 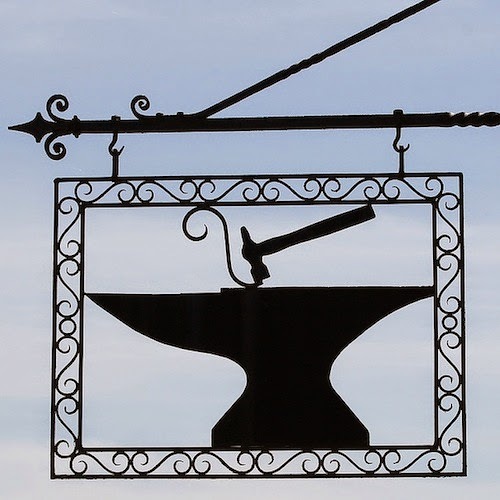 Each of the five venues of the World Equestrian Games had its own forge. Don't blink, they will soon be gone! British team farrier Haydn Price stopped by the forge at the main arena in Caen, where the dressage and show jumping took place, to take a few photos during the show jumping days at the end of the Games. Things were quiet, but you can see the way the forge was set up to handle the needs of horses during the event. You always hear about it, but rarely does anyone ever see it done. 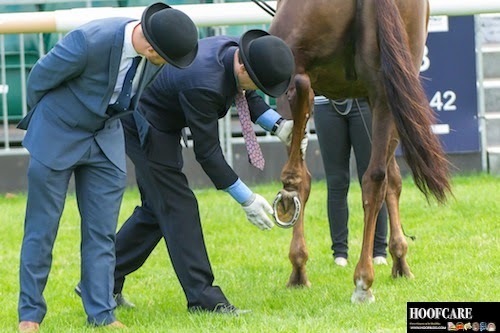 Sure, farriers get dressed up in suits and wear bowler hats and white gloves to inspect horse hooves. Sure they do. If a skilled novelist like Tami Hoag set out to pen an international suspense thriller about a jumper, I doubt a more compelling story could be imagined than the sad-but-true tale of Presley Boy. The timing, the cultures, and even the horse's name, suggesting the legendary but tragic American rock star, all fit together. And there's our old friend laminitis, right in the middle of it like the dastardly villain it is, to assure that a happy ending is not likely. 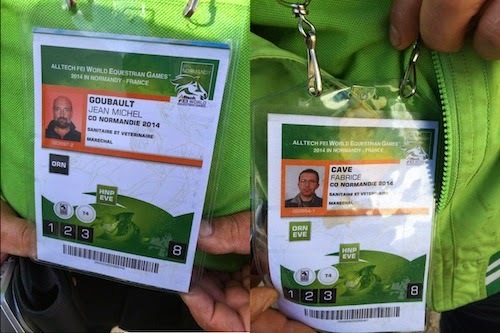 The World Equestrian Games had a staff of French farriers on staff at the vet hospital; here you see two credentials for Jean Michel Goubault and Fabrice Cave. Nigel said they worked at Haras du Pin, the National Stud in Normandy. The whole world was there, so there were bound to be more farrier pictures to show you. Thanks to British farrier Nigel Perrott, eventing team farrier for Ireland, who snapped (and shared) these photos. In this mystery of riddles, a man lies dead in the churchyard. The blacksmith's hammer is found nearby. Surely he committed the murder. If London was the Twitter Olympics, Normandy is the Instagram WEG. Never have we seen so many images, thanks to our phones. Never have our thumbs been so sore from scrolling through so many images. The image above is embedded from Instagram. It was posted today on the official account of The Games but no credit is given to the farrier who forged it--or who took the photo or how they managed to take it with all three letters hot! Perhaps official Games farrier Luc Leroy masterminded this?